Heating Pad, Flexible Cold Pack, and Lovable Bear - All in One! Chilly Bear - The Feel Better Bear™ is a plush, stuffed, toy "bear" with a warm, happy face, available in a variety of colors, serving a variety of purposes, loved for many reasons, in many places, by people of all ages, for nearly 20 years! Designed and Made in the USA by A-Maize-ing, Inc. 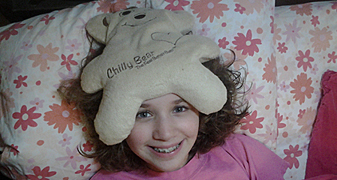 Chilly Bear - The Feel Better Bear™ is a heating pad, flexible cold pack, and lovable toy bear - All in One! Heat it in a microwave for use as a warm, pliable heating pad or chill it in a freezer for use as a flexible, pliable cold pack. Or, play with, hold, or keep nearby. Form fits to any part of your body for therapeutic value from head to feet and toes! Chosen by parents, doctors, healthcare institutions, healthcare practitioners, athletes, seniors, retailers, non-profit organizations and many others for more than 19 years, Chilly Bear - The Feel Better Bear™ is more than a child's best friend. Used and loved by people of all ages to feel better - whether at home, in a workplace, or on the go! Serving a wide variety of purposes and people, Chilly Bear - The Feel Better Bear™ is travel friendly, used as a bed warmer, fun toy (w/cute, happy character), and effective tool for healing when used as a heating pad, flexible cold pack, or lovable companion. Chilly Bear - The Feel Better Bear™ is available in your choice of colors, including pink, blue, and brown. Designed & Made in the USA with 30-day manufacturer's guarantee. Contact us about special partnerships and custom-design versions. Chilly Bear - The Feel Better Bear™ is used to safely and effectively target heat or cool chill to increase or constrict blood flow, to improve or impede blood circulation. To use as a heating pad or cold pack, heat in a microwave or chill in a freezer. Enjoy the many benefits of a flexible, pliable heating pad or flexible, pliable cold pack. Relieve stress, reduce swelling, migraines, other headaches, backaches, other aches, pains, sprains, strains, bumps, bruises, cramps, stiff neck, sunburn, sinus issues, sports injuries, carpal tunnel syndrome, insect bites, eczema, fever, menstrual cramps, asthma, post radiation cooling, and more. It's also a fuzzy, cuddly, stuffed bear with a big smile and happy face. Loved by all ages! See a series of 30-second videos by mothers who reviewed Chilly Bear - The Feel Better Bear™ for the 30SecondMom Favorites Awards program in September 2014. "When I worked as a nurse in a pediatric medical practice 16 years ago, a Motrin rep gave us samples of Children's Motrin and an orange Feel Better Bears with the Motrin logo. I took one home for my kids and have loved it ever since! As an adult, I love using this Bear. Since I suffer from headaches and neck pain, I put the Bear in the microwave, heat it up for 2 minutes, and rest the Bear on the back of my neck. It helps so much with my headaches! My daughter, now 21, has had knee surgery and loves using a Chilly Bear as an ice pack for her knee. Now that she's in college, she's wants one for herself. So, I searched and am excited to have found your website! I just bought a new Bear for my daughter as a Christmas gift. She'll be really excited! 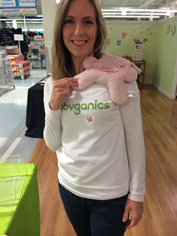 The Feel Better Bear isn't just for kids - it's for all ages!" "I saw this Bear about 10 years ago and bought one for my two granddaughters. It has been used for bumps, scrapes, fevers, sprained wrists and everything in between. Both girls run to the freezer to get Chilly when they have an injury, real or imagined. Now I have a new granddaughter and bought one for my son's house, but after this weekend with a one-year old with a fever, I knew I needed one for my house. Chilly has given comfort for years and will for many years to come. This is the BEST COMPANION that any family would ever have!! Thank you for giving us Chilly!!" 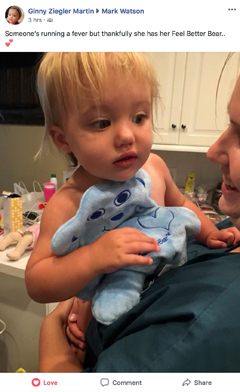 "I just wanted to let you know how much our patients appreciate your Chilly Bear, the Feel Better Bear. We have been distributing your lovable pink Bear to our pre-operative patients knowing they will need something cold to use following surgery for the first 24 to 48 hours to help with swelling. They are so delighted when handed this cute, cuddly, Bear that you can see some of their anxiety decreases. Chilly Bear is also given to our post-operative patients for heat beyond the 48 hours for comfort. These Bears are so well received and appreciated! We cannot thank you enough for your thoughtfulness and prompt delivery of these Bears. They truly make a difference to all the recipients! Thank you." "I thought we would get more at this time, but my husband thinks 6-8 is enough for now. I am sure we will end up needing more in the near future because they have had a tendency to fly off our shelf and into the homes of our friends!" "My favorite gift is the one we gave the midwife who delivered our daughters. We have a 12 year old son, 9 year old daughter, and 3 year old daughter - all regular users of our Bears, either the one in the freezer or one of three sitting near our microwave. Our midwife's daughter suffers from migraines. So, after our midwife delivered our first daughter, we gave her a Chilly Bear. She loves it! We're told she still uses it and that it helped her daughter get through many painful migraines." "My kids are 11 and 14. 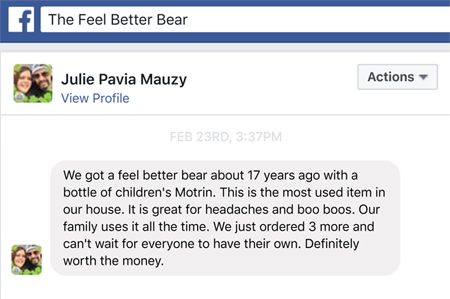 We got an orange Feel Better Bear with Children's Motrin when my oldest was very young. The Bear (we call it the Get Better Bear) is still in our freezer and used often. The boys are still comforted when we ask, "Should I get the Get Better Bear?" Now, I want to pass on a LIFE SAVER to my brother and his family. They have a 9 month old and lots of boo-boos ahead. I LOVE OUR BEAR! It is not overstuffed and stays put covering the whole area [on which it is placed]. My youngest can be found walking around with it on top of his head when he has a headache. My oldest loves it for when he has hives. It is not too cold on his bare skin. It is just a GREAT PRODUCT. Thanks!" 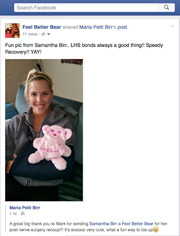 "My mom has had a Chilly Bear for years and, when I lived with her, we would share it. Now that I'm on my own, I want one for myself. I think it is so much better than a bulky heating pad, especially on my neck. Plus, I don't know of any other heating pad that can become an ice pack, too! I'm a huge fan!" "I am looking to buy 7-10 Bears as Christmas gifts this year. This is such a great product!! I've had mine for at least 7 years and I still use it all the time (and I'm 27)!" "I've been a Chilly Bear user for years! A college girlfriend had a Chilly Bear and I thought it was a great idea so I bought one for myself. I must have bought about 15 Bears throughout the years as gifts. People's reactions are so good when they finally realize what I gave them. I now need one for myself because I forgot I gave mine away. I just had surgery on Monday. I need my old faithful Bear to sooth my shoulders from all the bed rest and TV watching I've been doing. Thank you!" "I think of you every evening when my daughter gets our Chilly Bear out of the freezer at bedtime!" "Thank you so much for this great product! My seven-year-old son has eczema. It is really bad around his eyes. The area gets very red and inflamed and is very hard to soothe. I have always used ice packs on the really bad days, but he does not like them and cries through the whole thing. Of course, that makes it that much harder. Well, when I tried the Feel Better Bear on his eyes, he loved it! Works like a charm! It's soft and cold and gives my son the relief he needs :) It's great! Plus, when I come home from work, I use it on my back. Loving this Bear!" Chilly Bear - The Feel Better Bear™ - Designed & Made in the USA. Chilly Bear - The Feel Better Bear™ is a registered trademark of A-Maize-Ing, Inc.